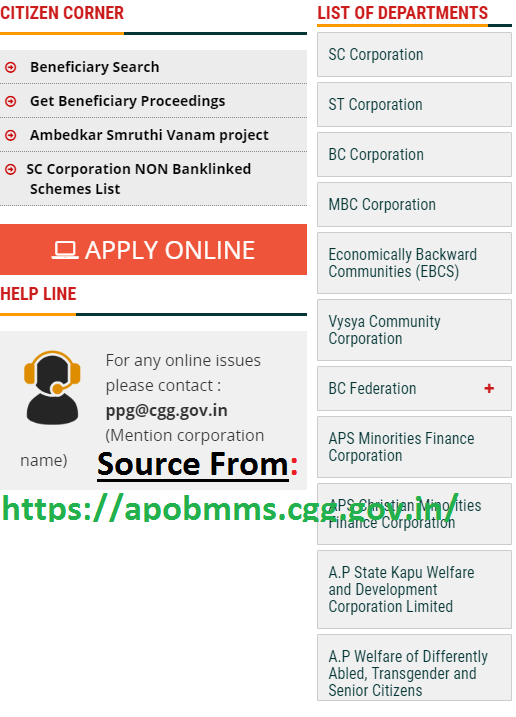 AP State Government decided to started web portal on AP OBMMS Online Application and Search for AP Beneficiary Search Details for SC, ST, Kapu, Minority Corporation etc at apobmms.cgg.gov.in…. In additional white ration KAPU holder in the Andhra Pradesh state have the privilege accessing loans. This are the small loans which will support their business. They can follow this link in getting the full information: https://apobmms.cgg.gov.in. The government has released a large amount to assist in this process, it has fund the KAPU holders with 1000 cores. This will go a long way in assisting any beneficiary of the scheme. The APOBMMS scheme has an age limitation from 21-45 years will benefit with the grants. Most of the candidates are students and from low backgrounds they get scholarships from the AP state government. All services on loan application are done online, this has eased the hassle of paper work and long queues for candidates who need the loans. Follow the few steps to get the application done. The home page appears and the menu bar will show different options. Select apply for online registration. The page will bring all the welfare corporation for you to choose. Pick the one which suits you: SC, BC minorities, ST, KAPU. Choose the sector you are based at either the fisheries, transport, agricultural isb etc. 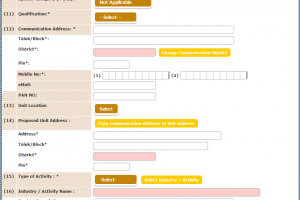 On the screen select the “go” button you will get a request whether you are sure you want the application form. Select “OK”. The form will appear on the screen you need to fill your address, the sector detailsand the beneficiary particulars. Key in your district, Mandal, panchayat, village, habitation. Now select the unit cost and enter all the bank particulars: name, surname, IFSC code etc. Key in your mobile number and reconfirm the number. Upload the most recent photo and very clear on the application form. To confirm the details click all and then re-check the document. Submit the application form if you are satisfied with the information. On the menu bar click on the beneficiary search. Have with you the Aadhaar card or the ration card. Fill the number on the space provided. Select search. The beneficiary ID will show on your screen. How do I check AP beneficiary status in apobmms.cgg.gov.in? Select beneficiary proceeding on the menu bar. Now enter the beneficiary ID you received when searching for beneficiary ID. Select on the get details tab. The details will open on the screen for you to follow up. AP state KAPU welfare and Development Corporation. AP Medara finance corporation ltd.
AP washer men coop society’s federation ltd Hyderabad. AP sagara (uppara) cooperative society’s federation limited Hyderabad. AP valmiki/ boya cooperative societies’ federation limited, Hyderabad. AP Krishna Balija, Poosala cooperative societies federation limited, Hyderabad. The loans provided by the government have certain objectives which help the common man one way or another. They offer jobs to low or vulnerable individuals to create income and boost their livelihood. The scheme offers training programs and upgrading the beneficiary skills thus helping the beneficiary improve his/her life. Close gaps in the society by giving funds which will help individuals start a business. The system is transparent and fair to all individuals in India. The registration of beneficiary is mainly done using the Aadhaar card. All the member who have applied for the loan will get crucial information through the SMS. There will be scheduled interviews which will be communicated via SMS to both beneficiary and the members of committee. The Mandal will give consent on the beneficiary. All the chosen beneficiaries have to give their bio-metric information. Details about the bank account are given online by the banker. The loans applied within 24 hours are also approved. The beneficiary needs a ration card or bank account to produce the loan. After the selection of beneficiaries the MPDO has the mandate to forward the names to the district office. Then after handling to the district office the AEO verifies the beneficiaries together with Sr. assistant. The collector approves the file which is forwarded by the ED and he also generates the file too. The cheque is approved by the MD this is through the online method. The bank assist in the disbursing the loan. All the photos and details will be uploaded by the field officers after their approve you need the loan and the business to be established. You need a photo which will be uploaded from your Aadhaar card. Certificates: Christian minority caste, revenue officer, SSC certificate, baptism certificate. The date of birth will be picked from your Aadhaar card. What are the benefits/advantages of APOBMMS? The process is transparent and efficient for all citizens in India state. The beneficiaries and members of committee get all the alerts and information about the scheme. You don’t to doubt the scheme since the information is distributed fairly. The whole process is fast and individual will get the loans as soon it is approved. The bank also doesn’t delay releasing the funds. The process of application is very easy you don’t need to visit any office or waste time on long lines. The system is always open as long you have internet. The online portal is not restricted to anyone. The loans or benefits have long span in refunding the individual is given time to work. The government approves fast and doesn’t discriminate individuals according to the districts. Has simple terms for beneficiaries doesn’t need complex documents. The scheme has brought together a large number of Indian citizens and opened small business. With given statistics of 4, 05,393 from the being and still counting. Stamps and Registration Department Uttarakhand is one of the major departments that provide the highest revenue to the state of Uttarakhand. This department is tasked with the responsibility of keeping and safeguarding all the transactions associated with properties that may be carried out by all citizens of Uttarakhand state. To access the various services that are offered by this department, you will have to access their personal website which has been specifically created for the sole purpose of serving all the citizens of Uttarakhand who may want to find more information about their property. With this website, you no longer have to worry about traveling long distances in order to access the offices of Stamps and Registration Department. This saves on time and transport costs that would otherwise be incurred when moving from place to place. Citizens of Uttarakhand can be able to enter data which is required when one is registering or applying for a marriage document. This online service ensures that every person is able to enter the correct data while also saving on time that would otherwise be required when keying in data in any Sub-Registrar’s Office. Through this website, you can also be able to register different transactions especially those which are linked to your personal properties. This service makes it possible for citizens of Uttarakhand to avoid cases of fraud since all the documents are kept in a secure place. Stamps and Registration Department also plays the role of a “Store Keeper” by keeping all the records pertaining to properties. These records can then be provided in a Court of Law as proof whenever there is a misunderstanding. Through the e-Search service, you can be able to search for any registered document. This can be done at any time of the day regardless of your current location. E-Valuation service allows you the opportunity of calculating your Stamp Duty and the exact fee required for registration. You can also make an online appointment for registering deeds by simply using the e-Stepln service in this website. For couples who wish to register their marriage, then they can easily do this online using e-Marriage service provided in the Stamps and Registration Department Uttarakhand website. Searching for a registered document has never been this easy thanks to the e-Search service provided in the Stamps and Registration Department Uttarakhand website. Initially, you would have to visit your Sub-Registrars office to complete this action but thanks to the internet all this is past tense. Below is a step by step explanation on how to use this service so long as you have an internet connection and a device that can easily access the internet. 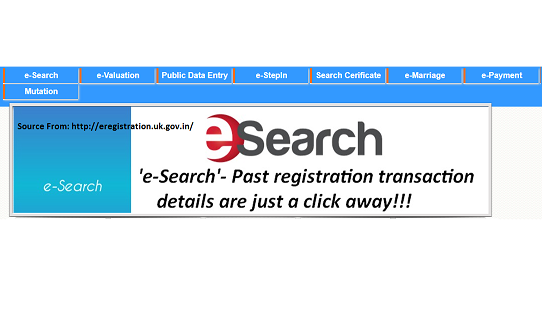 On your browser, type in http://eregistration.uk.gov.in/e_search/Default2.aspx as the official link for accessing Stamps and Registration Department Uttarakhand Website. Once in the website, you will be required to click on “e-Search” option that can be easily seen from the home page of this website. This action will automatically redirect you to a new page on the website. In the new page that appears, you will have to choose the option that you want to use for searching your registered document. Options available include; Search by Village, Search by property number, search by party name, Search by registration number, Search by PDE number and Property wise transactions. To search by village, you will have to click on “search by village” option before keying in details such as the district, Sub-Registrar Office, location and registration year. Click on “Search” once all the details have been entered. The same procedure will be followed when searching using the party name, registration number, property number and property wise transactions. When using the ‘Search by PDE number’ option, you will only have to enter the PDE number before finally clicking on “Search” button. The bridegroom must be 18 years and above. The solemnization place or permanent residence of the bridegroom must be within the jurisdiction of the registering officer. Click on http://emarriage.uk.gov.in/PDF/Certificateby.pdf once all these requirements have been met to download and print the marriage certificate form. Once the form has been downloaded and printed successfully, you will have to certify it by using the appropriate authority before you can finally fill it. Remember, the e-Registration number will only be valid for 30 days after you have filled the certificate form. The guide below will be useful for any person who wants to apply for an online appointment to register deeds for e-stamp. 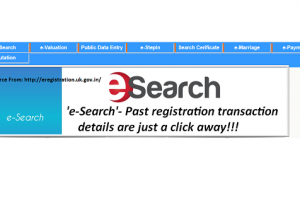 On your browser, whether Google Chrome, Mozilla Firefox or Internet Explorer, type in http://eregistration.uk.gov.in/ as the official link for accessing Stamps and Registration Department Uttarakhand website. Once in the website, click on “e-stepln” option that can be seen from the homepage of this site. You will automatically be redirected to a new page on the site from where you will have to make an online appointment. Find the sub registrar office of your district from the options displayed and make an appointment. You have the option of choosing from three shifts depending on the time that you are free. Shift one is available from 9:30 AM- 11:30 AM, shift two starts from 10:30 AM-12:30 PM while shift three is available from 3:30 PM-5:30 PM. The Sub-registrar office will then give you an appointment number and date for the appointment. The feedback is usually given after 15 days once you have made your online appointment. 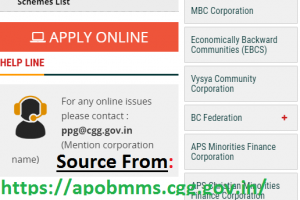 PMEGP Online Application Registration in PMEGP Telangana and PMEGP Gujarat states at www.kviconline.gov.in…. National Level: At the National level, this programme is administered by Khadi and Village Commissions (KVIC) agency. State Level: There are various agencies tasked with the responsibility of administering PMEGP at the state level. They include; Khadi and Village Commissions (KVIC), District Industries Centers (DICs), banks and State Khadi and Village Industries Boards (KVIBs). What is Khadi and Village Industries Commission (KVIC)? Khadi and Village Industries Commission abbreviated as KVIC is a governmental controlled agency that is tasked with the responsibility of providing employment to women and youths of India. Through this programme, the youth of India have been able to start cottage industries and make a living from them. This has greatly contributed to the growth of India’s economy since the government is able to get revenue from the new industries created in the Lakh villages throughout the country. For any person who wishes to directly access the services of KVIC, visiting their offices is highly recommended. Their offices are found close to District Collectors Offices or in other building that houses District Industries Centers at the District headquarters. For the purpose of speed and convenience, the Government of India has come up with a PMEGP ePortal scheme that contains every detail concerning PMEGP. The portal was mainly set up for the purpose of generating employment in rural and urban areas by setting self employment for the youth and women. The portal is also tasked with the role of providing a sustainable and continuous source of employment to traditional artisans that live in rural areas. This helps in reducing congestion in urban areas since the rural to urban migration of youth is placed under control. On your browser, whether Google Chrome, Mozilla Firefox or Internet Explorer, type in PMEGP Homepage or use https://www.kvcionline.gov.in as the link to the page of PMEGP. Once in the page, click on “How to Apply” option from the tabs that are displayed on the homepage of the site. In the new page that appears, click on “Online Application Form for Individual” This action will automatically redirect you to a new page on the site. Correctly fill in the details required including the Aadhar Card number, name, gender and the state that you reside in. Other details that need to be filed are the type of activity, project cost and the name of your bank. Click on ‘Save’ once all the details have been correctly filled. A group that wishes to fill PMEGP form can also do so online so long as they have an internet connection and a device that can make it easy for them to use the internet. Once all these are in place, the guideline below can be used to fill the form online thus saving the time that would otherwise be used in accessing PMEGP offices. On your browser, type in PMEGP Homepage or use https://www.kvcionline.gov.in as the link to the official page of PMEGP. In the new page that appears, click on “Online Application Form for Non-Individual” This action will automatically redirect you to a new page on the portal from where you are to fill in the form. 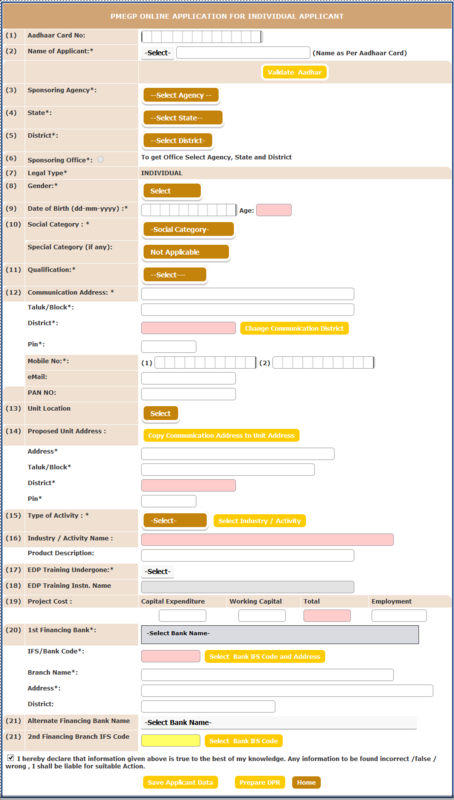 Correctly fill in the details required including the name of your group and the state that you reside in. Other details that need to be filed are the type of activity that the group wishes to venture in, cost of the project and bank account used by the group. Finally, Click on ‘Save’ once you have finished filling in all the information that was required. PMEGP e-tracking System was mainly designed for the sole reason of ensuring transparency when it comes to implementing PMEGP. This E-tracking System is also important when it comes to developing the database that is used by the beneficiaries of PMEGP scheme. With this system in place, cases of corruption are rarely unheard of since the loans are awarded based on the project that an individual or group has. It is also possible to check the status of your PMEGP application by using the e-tracking system. This is easily done on the PMEGP portal by clicking on the “PMEGP e-tracking System” option from the homepage. The PMEGP loan is given to individuals or non-individuals who have successfully applied for the loan whether through the online portal or by visiting PMEGP offices. This loan is usually disbursed after 3 to 4 months and may sometimes take close to one year depending on the KVIC officials and all the documents that you submitted while sourcing for the loan. After successfully submitting the application, a meeting with the officials will follow up. Once you have been interviewed by DLFTC, you will have to wait for the results before the file is finally forwarded to the bank that you are registered with.